​and Reflect on Contribution of Leonard Nimoy"
"This is a must read for Star Trek and Spock fans!" Get your Autographed and Personalized copy for $14.99! Spock and Spock! What is Spock? At the Undiscovered Country Project, he is, among other things, the inspiration for Spocktober - an annual, month-long event that arrives in October. From 2011 to 2014, the Undiscovered Country Project website hosted several unique and original guest blog posts during Spocktober that we felt deserved more attention. So, the Spockology collection was born! 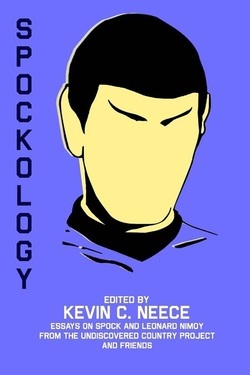 We have also included in this book several new pieces about everyone's favorite Vulcan and the man who brought him to life, the legendary, brilliant, and greatly missed Leonard Nimoy. This is a small tribute to him and his legacy. The symbol of Logic, the icon of the outcast, the central figure of the Star Trek mythos, Spock is many things. But he will always be, simply, "Fascinating." "All in all, this is an interesting read and a fine memorial to the memory of Leonard Nimoy." 7. Spock, the Light of the Romulans - Mickey Haist, Jr.